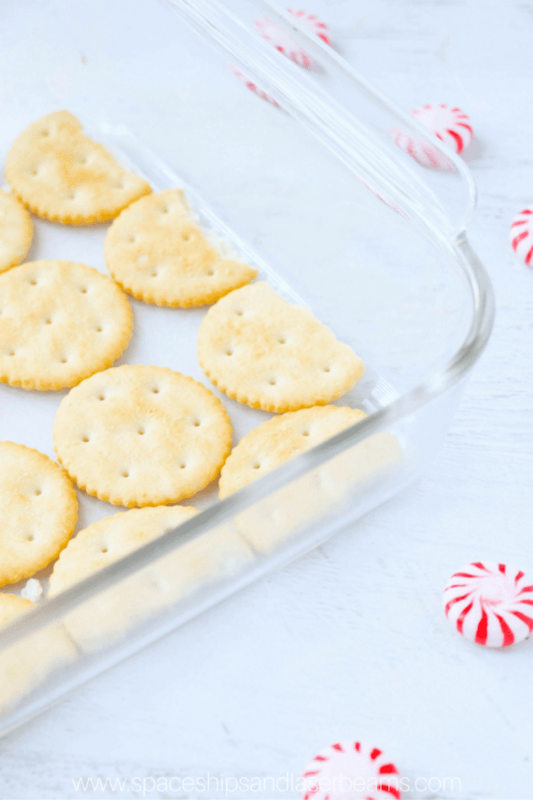 One of my favorite homemade candies, no matter what the occasion, is this Ritz cracker toffee – so I thought I’d get festive and make a Peppermint White Chocolate Cracker Toffee for the holidays! Keep warm this winter with these Hot Chocolate and Peanut Butter Balls. Kids will love helping to make these Easy Gingerbread Snowman Sugar Cookies. Try these Chocolate Peppermint Winter Cocktails too. 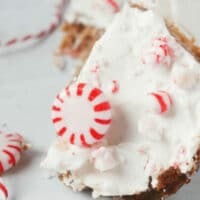 No matter what (or if) you celebrate during the month of December, everyone can agree that this Peppermint White Chocolate Cracker Toffee is the perfect easy candy recipe to treat yourself and your guests to – crunchy, sweet toffee topped with a smooth layer of white chocolate sprinkled with little bursts of peppermint! 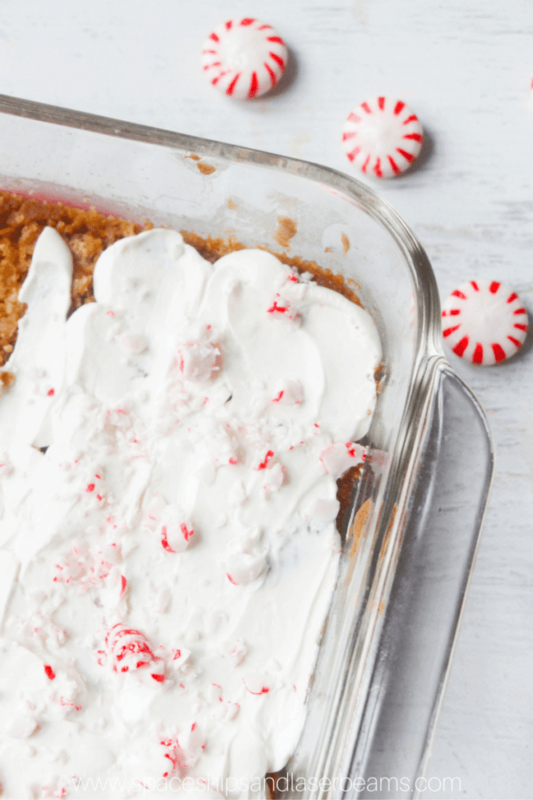 Feel free to substitute your favorite holiday candy for the peppermint candies, or just opt for seasonal sprinkles. This whole recipe comes together in less than 15 minutes and then it just sets up in the fridge as you get ready for your holiday get-together (or just get into some cozy pyjamas and make a cup of hot chocolate if you’re making this as a late night treat). 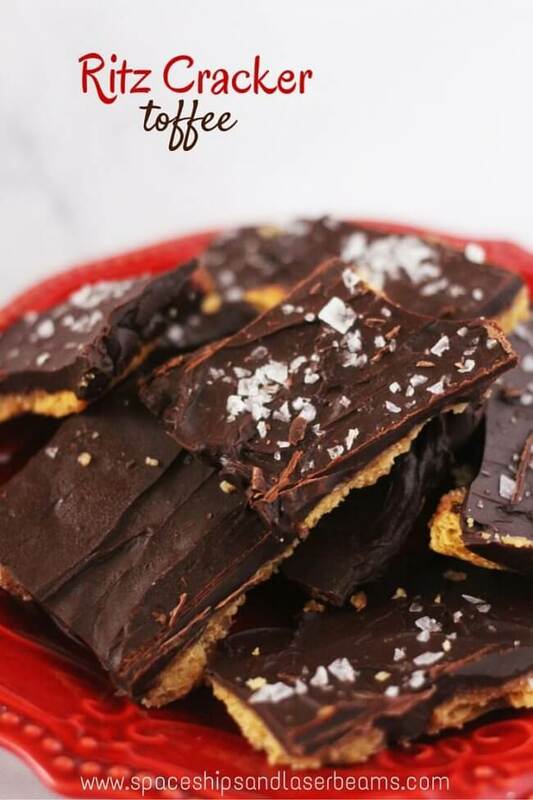 The last time I made a white chocolate cracker toffee I used candy melts and placed it in the microwave – this time, I used chopped almond bark. I didn’t love how it turned out in the oven and still prefer melting the topping in the microwave, if your pan isn’t too hot to be placed in there. 1. Preheat the oven to 350F. 2. 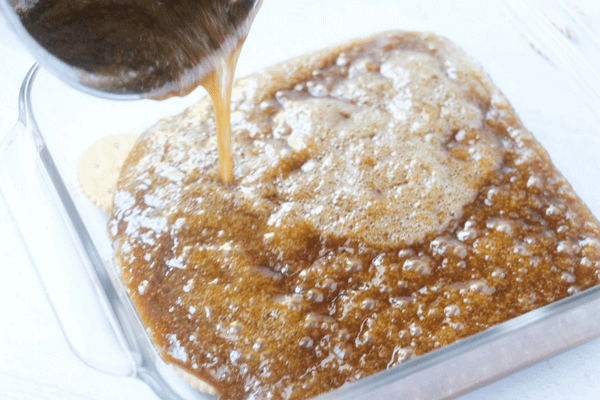 Place the butter and brown sugar in a medium-sized saucepan over medium heat and melt. 3. Avoid the urge to stir it too much, as that can separate the caramel. 5. 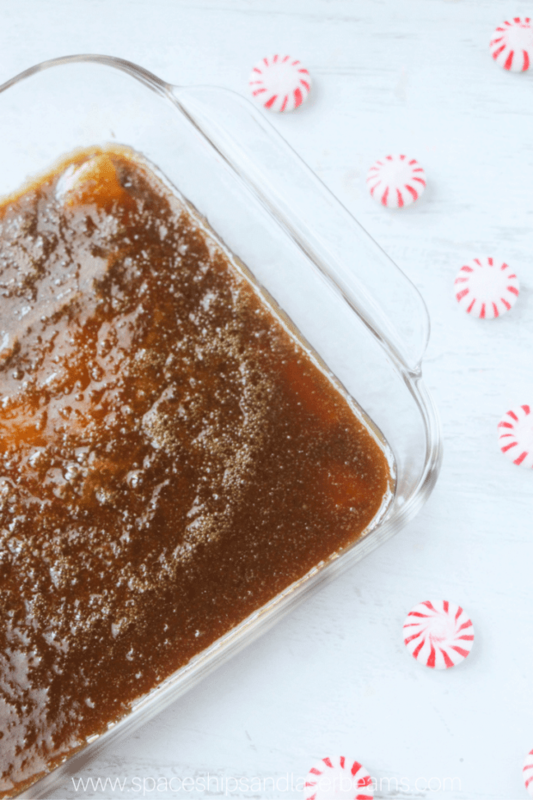 Bring the caramel to 250F if you have a candy thermometer, or to about this colour – it should be a consistent texture with no standing butter. 6. Pour the caramel over the crackers and spread to the edges with an offset spatula. 7. Place the tray in the oven for 5 minutes until the caramel has formed a hard candy with the crackers. 8. Meanwhile, chop up your almond bark or measure out your candy melts. 9. Sprinkle enough white candy melts or chopped almond bark over the toffee to cover it completely, and then melt in the microwave in 30-45 second bursts. Spread with an offset spatula to cover. 10. Place the peppermint candies in a small bag and smash with a mallet or rolling pin. 11. Sprinkle the crushed peppermints over the melted chocolate while it is still wet and then add on sprinkles, if using. 12. Place the whole thing in the fridge and allow to set at least one hour. 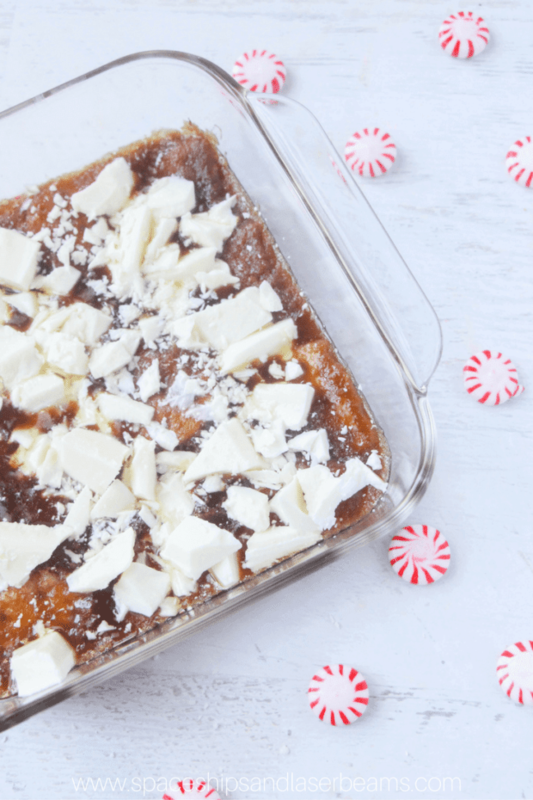 Pin this homemade Christmas candy recipe for the holidays! Preheat the oven to 350F. 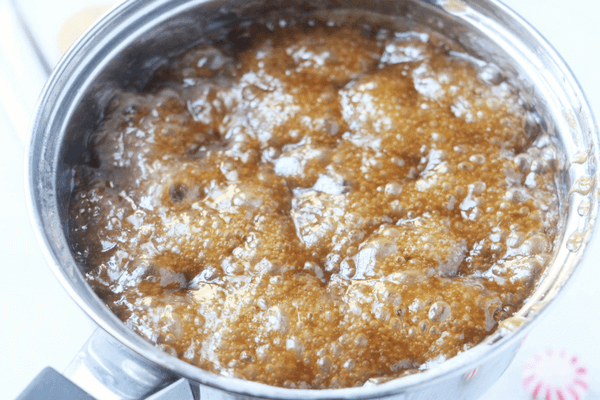 Place the butter and brown sugar in a medium-sized saucepan over medium heat and melt. Avoid the urge to stir it too much, as that can separate the caramel. Bring the caramel to 250F if you have a candy thermometer, or to about this colour - it should be a consistent texture with no standing butter. Pour the caramel over the crackers and spread to the edges with an offset spatula. Place the tray in the oven for 5 minutes until the caramel has formed a hard candy with the crackers. Sprinkle enough white candy melts or chocolate chips over the toffee to cover it completely, and then melt in the microwave in 30-45 second bursts. Spread with an offset spatula to cover. Place the peppermint candies in a small bag and smash with a mallet or rolling pin. Sprinkle the crushed peppermints over the melted chocolate while it is still wet and then add on sprinkles, if using. Place the whole thing in the fridge and allow to set at least one hour. Don’t miss the latest recipes! 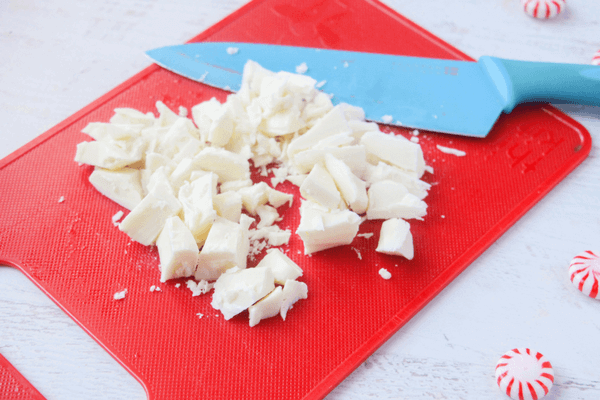 This is our go-to Christmas treat recipe. It is always a favorite. 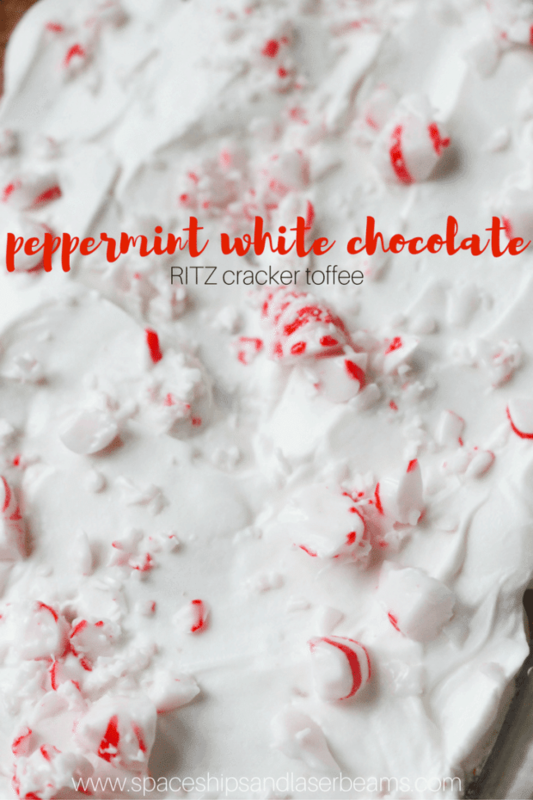 I made a batch of this as a holiday treat for my neighbors this year and loved the taste of the peppermint combined with white chocolate. My name is Stephanie, and thanks to my adorable son, I am celebrating a life filled with boyish charm. Join me and my best boy-mom friends as we share fun recipe and party ideas, games, cool crafts, DIYs and more. Don't miss the latest recipes!